Violence against women, including domestic violence, is a serious public health crisis. Its psychological and economic effects, affect everyone – men, women, children, future generations and ultimately nations. All tangible and non tangible forms of domestic violence, either by men on women or by women on women, are violations of fundamental human rights. Regrettably, domestic violence continues to exist in the 21st Century all around the world. It not only affects the physical and mental health of women, but also results in a loss of self-esteem, confidence, quality of life and self sufficiency. It impedes the advancement of an individual’s legal, social, political and economic status, hence greatly affecting their productivity and contributions toward the family and country. In Pakistan, the necessary legislative work has been undertaken for combating violence against women, and many initiatives have been introduced in order to protect and support women victimised by violence and to punish the perpetrators. These legal efforts, however, are not sufficient by themselves to combat violence, particularly domestic violence that takes place in the safest sphere of life, the family. Raising social awareness on gender equality and ensuring the necessary mental transformation are of utmost importance in the prevention of violence against women. Public awareness campaigns and outreach programmes are part of effective interventions that bring change in individuals and communities on the whole, by addressing gender norms and attitudes while simultaneously enlisting men as responsible partners against GBV. Every year, the United Nations declares the period from November 25- International Day for the Eradication of Violence against Women, to December 10 – International Human Rights Day, as the 16 days of no violence against women across the globe. 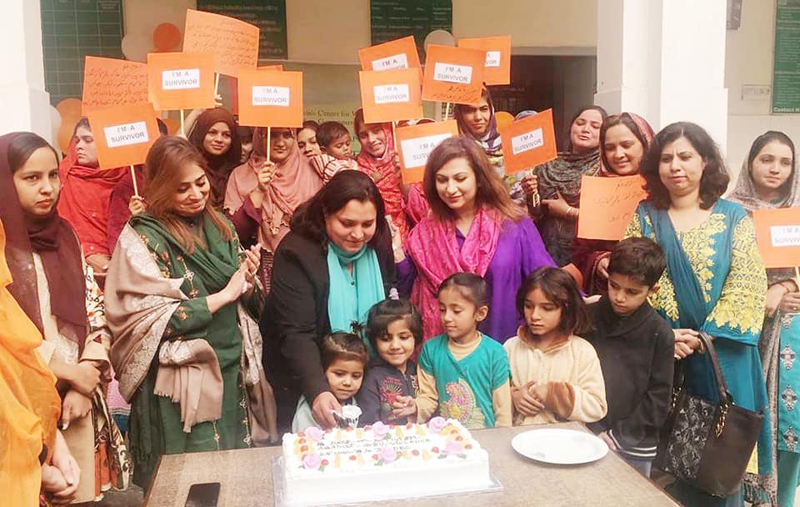 Availing the high impact of this global campaign, Shaheed Benazir Bhutto Human Rights Crisis Centre for Women, Lahore, in collaboration with All Pakistan Women Association (APWA) initiated a holistic community outreach campaign Aware to Empower in various under privileged areas of Lahore and its surroundings involving various means of interaction including focus group discussions on ways to break the cycle of violence and disempowerment, information dissemination about current pro women legislation and available forums for redressal of abuse. 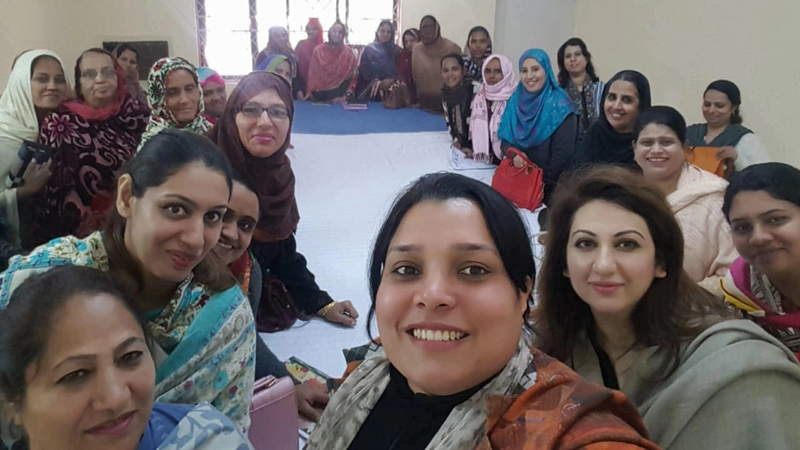 Detailed introduction about the service delivery mechanism of the state and social sector was made through interactive talk sessions with women and young adults, distribution of flyers and brochures on mass level along with public service messages on electronic, social and print media. This community outreach programme held sessions in various areas including Pir Colony Manga Mandi, Begum Pura, Mast Iqbal Road Chungi Amar Sidhu, Government Girls School Shad Bagh, APWA Centre Jail Road, Bali Technical School Village Ladheke Bhullar, Sessions Court, Darul Aman and various community centres and schools of APWA. The primary focus was to orientate the masses about the negative impacts of violence on individuals and the society as a whole and to convey the message that strong legislation exists to prevent the rights of the vulnerable and that all of us, as citizens, have responsibility on the subject. While meeting women and young adults in various local communities, the need for increased coordinated efforts by all service providers was strongly felt. Although the biggest human rights violation the vulnerable populations go through is hunger and poverty, a wholesome trickledown effect of all the measures grandly taken by the social safety networks at the national and provincial levels, is yet to be seen. 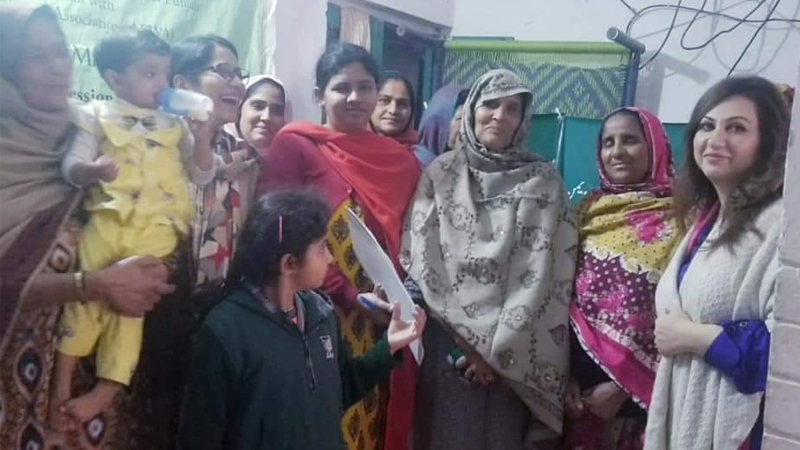 To improve their socioeconomic status, majority of the women we met, were eager to learn skills and contribute to the household financially but unfortunately there are less available forums of skill development. The locations of the training centres, the eligibility criteria, the high markup and rigid conditions of microfinance institutions are some of the major limiting factors. Most importantly, there are very less opportunities to earn a livelihood through employment as per the acquired skills. The huge gap that exists requires active intervention by the state and non state organisations working for the welfare of the people, to enable women and young girls to overcome this friction and economically empower them. It’s a well established fact that gender inequality and violence hamper countries’ efforts to reduce poverty. Women and girls are half of the human capital available to reduce poverty and achieve development. Their economic independence not only greatly reduces the ratio of violence but on a larger scale, gives a healthy surge to the country’s economy. Along with addressing the economic needs, one of the initial steps towards improvement can be the setting up of an all purpose helpline by the state to cater to the queries of the public regarding legislations, educational empowerment, economic independence and all other intersecting issues. Above all, information about all the service delivery forums available by the state and non-governmental organisations should be consolidated and given access to. This access to information will impart, in various ways, the much needed education that enlightens minds and gives the ability to question those norms that silently restrict potentials and hamper progression of nations. Aware to Empower began in the backdrop of the 16 days but it is not just for those 16 days for us. Ending violence, whether physical or economic, is not a short term endeavour. It requires coordinated and sustained efforts from all of us. We pledge to stand up against all human rights violations, specifically domestic violence, and to lend our voices to raise awareness for a better tomorrow. We encourage you to do the same. Not just for 16 days.